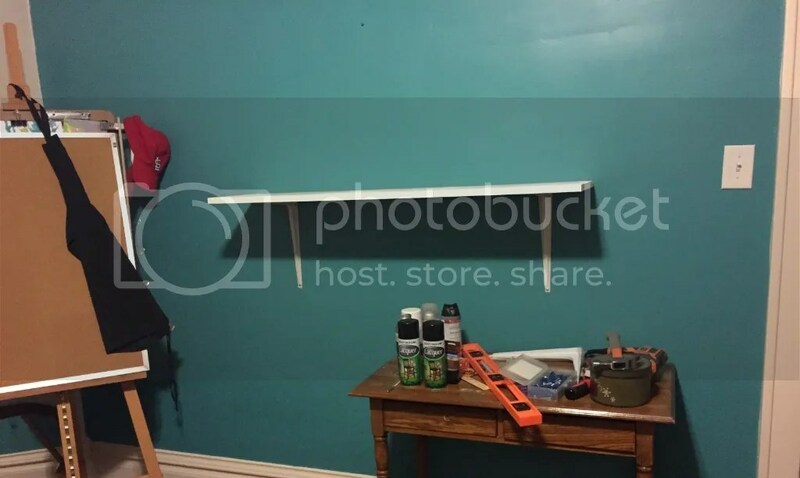 Because the holidays aren’t stressful enough, we’ve been completing a few home improvement projects over the last couple weekends to boot. Are we crazy? Probably, but the projects have turned out really well and look great. Kellie is an artist, a designer, and always has a fantastic vision for our home. 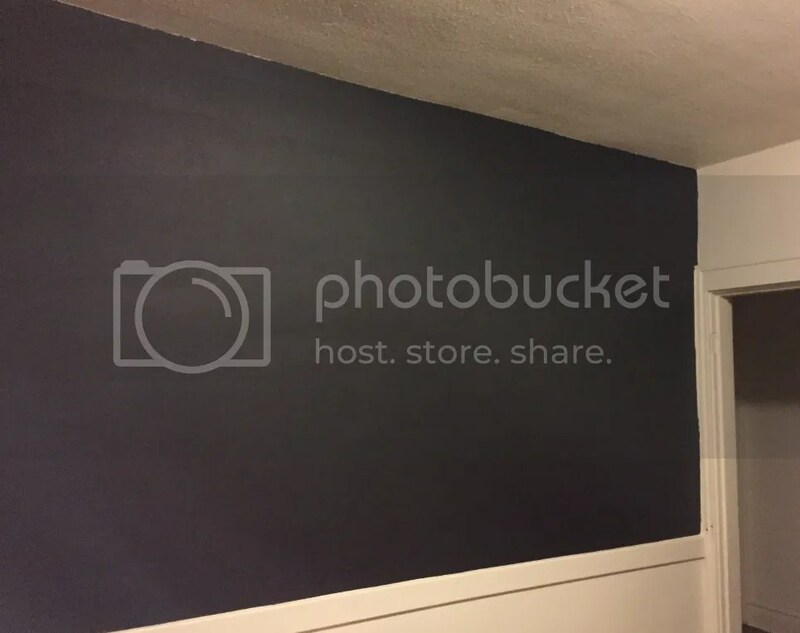 Floating shelves are planned, and chalk art of course 🙂 That huge, blank space just made the room feel ugly. Much better now and more to come! We’re very happy and think it’s a great start on the space. 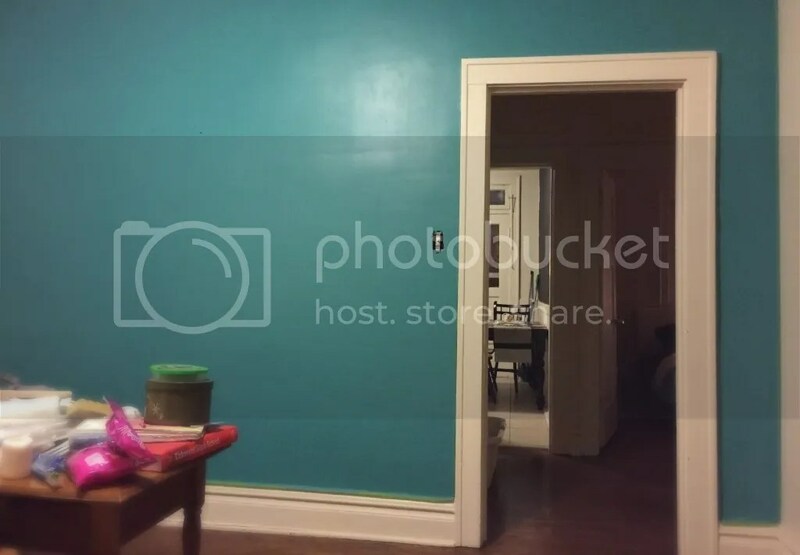 Next will be some kind of long, flat, raised works-pace along that wall. A section of laminate counter top maybe? 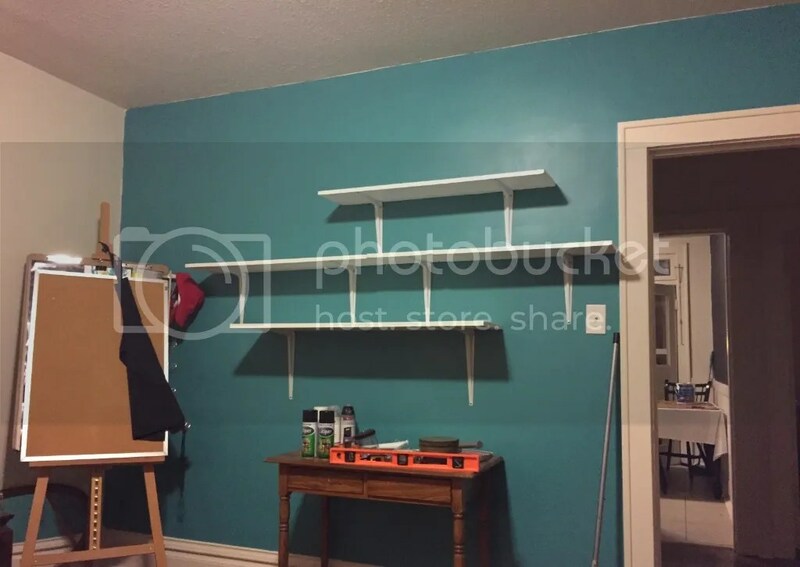 She’s seen a number of examples online where folks have used thick MDF. 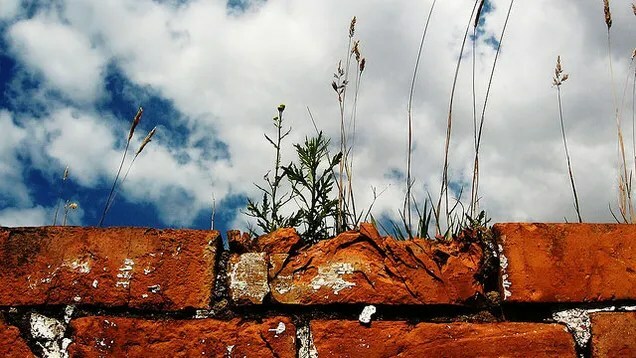 We’re big on using reclaimed materials when possible so the hunt continues! Last night we had the pleasure of watching Finding Vivian Maier, a fascinating look into the discovery and life of, and the mystery of, photographer Vivian Maier. If you’re at all interested in photography, or American social history, documentaries or Art, you should check out this movie. An unknown in the art world (until after her death in 2009) Maier was a prolific photographer, among other things, but the uncertainty about why she lived her life the way she did is what made her story so interesting to me. I picked this up from the library completely randomly. I’d never heard of her, or the guy who made the film, but I’m very interested in photography and was hooked by the intro on the back. Words that were going through my head as we watched were: staggering, incredible, creepy, enthralling, distressing, sad, and amazing. I really can’t recommend it enough, look for it and check it out. 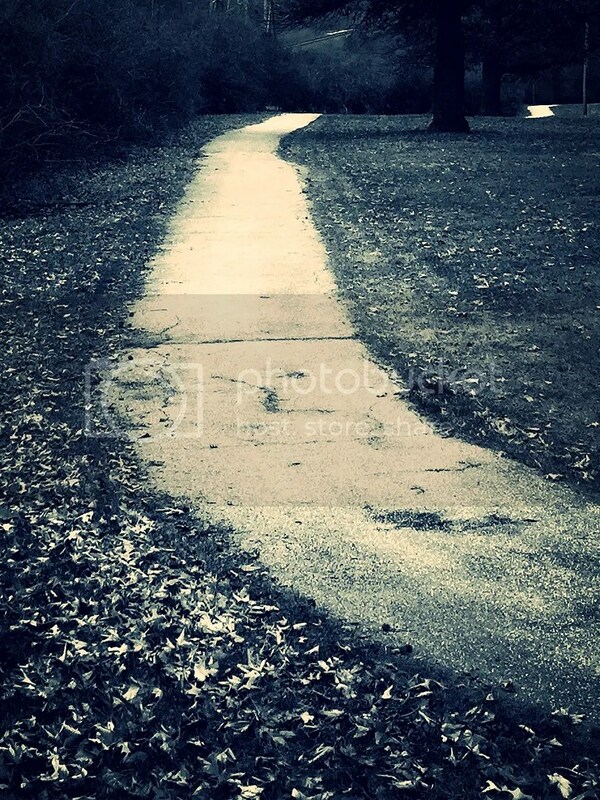 The traveler trod a tree-lined trail, macadam cracked and worn much like the boots on his feet. A menacing hedgerow loomed on his left, branches and brambles waving in the wind, willowy and weeping witches’ heads creaking and crackling in the bitter wind. What he believed to be trees to his right instead were a forest of gnarled, twisted hag hands, reaching pitifully for the cold, gray sky. Beast and bird scuffled through the undergrowth unseen, but for a few feathered fiends, glinting like jet among thorns and thistle. The traveler trekked on, heedless of how his path proceeded. A step at a time, bracing himself against angry aerial avian gusts, gangs of obsidian obscuring the way. Above in filigree fingers a shrieking, screeching scornful sound followed our fellow, frightening and frustrating him as he fought free, bleeding from the bedeviling battering of wings, a choking cloud of drowning darkness. The horrible howl of a Jay, jeweled in sapphire, diving dangerously down upon the poor retch’s hatless head. Painfully pursued, plodding perilously as twilight descended, the wonderer wondered wearily whether weather would win, wearing him out til too tired to traverse the remaining distance. When suddenly a cheerful chirping chimed through the wood. He hearkened, halted hopefully as the hateful Jay circled once again. Seeing the source of such satisfying song, a smile broke across the man’s mug. 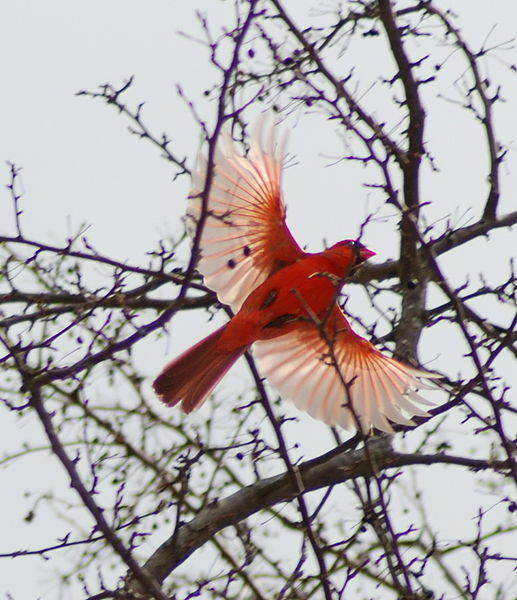 The Jay cried once more in defeat, dashing away into darkness as a pair of garnet-breasted Cardinals settled onto our hero’s heaving shoulders. through seals of oil & bolts. painting a halo over the bust of Michelangelo. dragged by an anchor low through iron railings. The guards skin figures by the gate. Last night we watched Neighbors, a relatively new (give me a break, I’m behind the times!) DVD release featuring Seth Rogen & Zach Efron (and Rose Byrne in a role that surprised me, she always struck me as more “refined” lol, but I digress) in a raunchy comedy, co-produced by Rogen. I like those actors, and the movie was ultimately pretty funny, but overall I’d have to give it a thumbs down. If you haven’t seen it don’t bother. 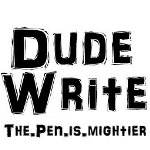 There are funnier, better written flicks out there. Just saying. We watch a lot of movies (or try to) on nights the Blues aren’t playing, which is fun and I sometimes just grab titles that I’ve heard are good and occasionally we get a dud. It happens. The Blues *are* on tonight and it’s their 2nd and final regular season meeting with the New York Islanders. I’m a fan of the Isles, they’re my team in the East, but when the Blues visited Long Island last week they were treated pretty poorly by their host. Smacked around and down 3-0 after only one period, the Blues eventually fought back (figuratively) and won the game 6-4, but at great cost. About halfway through the 2nd period, with the score 3-2 NY, Islanders forward Anders Lee hit Blues defenseman Carl Gunnarsson right in the face with a flying elbow, possibly knocking him briefly unconscious (watch the way Gunny falls to the ice) and putting him out of not only that game, but giving him a concussion which has him currently unable to play, missing the next game and likely any hockey skating or otherwise for the near future. Lee wasn’t called for a penalty on the play, despite direct hits to the head being deemed illegal by the NHL. He did end up having a hearing with NHL Player Safety though only after the league learned of Gunny’s concussion. Lee wasn’t suspended (as many felt he should be) and received only a $2,286.29 fine. Half a day’s pay and the most allowed under the current collective bargaining agreement. Concussions in sports have a glaring spotlight on them these days and while the NHL claims to be interested in eliminating dangerous plays (i.e. blows to the head) I don’t think the punishment fits the crime here. It shouldn’t matter if the hit was unintentional. It also shouldn’t have made a difference how severe the injury was. It was a direct blow to the head which was the initial point of contact. By the NHL’s own definition a dangerous play. Concussions end careers, and who know how Gunnarsson will recover from the hit. If you put a guy out by hitting him in the head you shouldn’t play until he does. The main reason I drudge up this story is that tonight the Islanders are visiting Scottrade Center in St. Louis. Anders Lee already showed he wasn’t man enough to stand up for himself last week when, later in the game, Blues enforcer Ryan Reaves challenged him to a fight. I’m extremely curious to see what, if any, retaliatory action is taken by the Blues on the ice against Lee. I’m torn between never wanting to see a guy get hurt and hoping to see Lee bleeding on the ice. Yeah, I went there. This is a weekly prompt from Should Be Reading, and it’s easy to play along, fun to share and find new books. 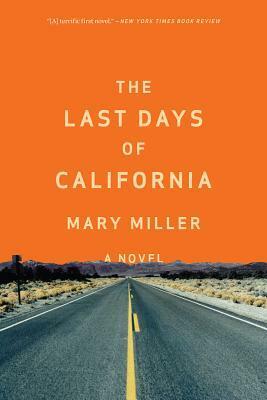 Right now I’m reading The Last Days of California, by Mary Miller. I guarantee it’s not what you’re thinking before you pick it up. Very interesting characters doing something most of us have may have done, but for likely very different reasons. 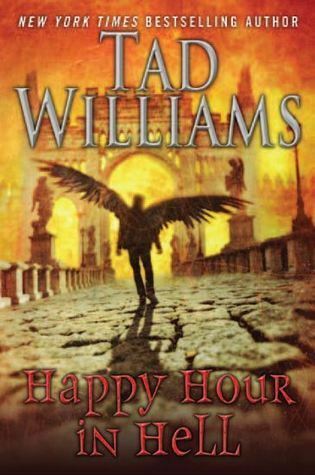 I just finished reading Happy Hour in Hell, the second book in a Bobby Dollar trilogy by one of my favorite Fantasy authors, Tad Williams. Pick up ANY of his books, you’ll be glad you did. 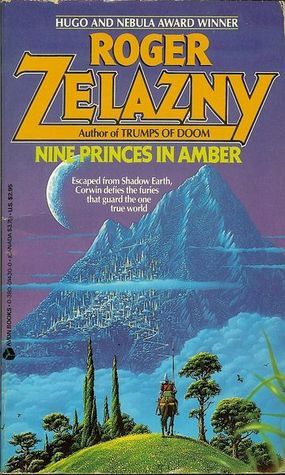 Next up will be a Sci-Fi Classic of sorts, Roger Zelazny’s Nine Princes in Amber. Originally published in 1970, this is a strange tale, written in a strange manner by what I can only believe was a strange dude. It’s the first of apparently TEN books set in the land of Amber, and I may end up reading more of them. I could only find this one in a beat up anthology of the entire series. If you join in on the sharing, be sure to link up in the original post for today over at Should Be Reading. Max slowly raised himself up on his elbows as the smoke cleared. The hallway stank of sulfur, urine, and fear. Broken shards of glass fell tinkling to the floor, abruptly breaking the eerie silence. NHL to Batman to Call of Duty. We get gaming. Cynical musings of an absurd mind. Uncovering an urban STL, through sight, sound, taste and touch! 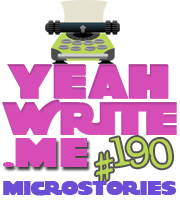 A writer's blog about everything.